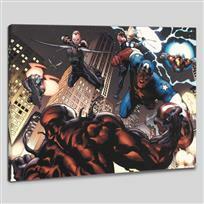 "Amazing Spider-Man #648" Limited Edition Giclee on Canvas by Humberto Ramos and Marvel Comics. Numbered and Hand Signed by Ramos and Stan Lee (1922-2018). Includes Certificate of Authenticity. 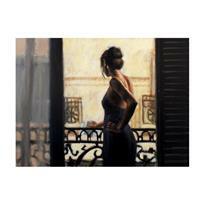 Fabian Perez "Balcony at Buenos Aires IX" Hand Embellished Limited Edition Canvas (32x40); Hand Signed, with COA. 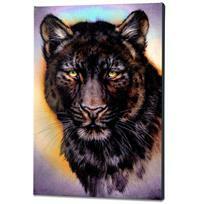 "Black Phase Leopard" Limited Edition Giclee on Gallery Wrapped Canvas by Martin Katon, Numbered and Hand Signed with Certificate of Authenticity. 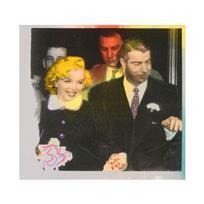 Ringo Daniel Funes - (Protege of Andy Warhol's Apprentice - Steve Kaufman) - "Mr. and Mrs. DiMaggio" One-of-a-Kind Mixed Media Painting on Canvas, Hand Signed with Certificate of Authenticity. 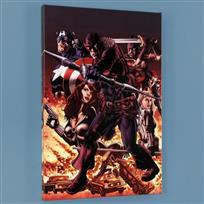 Marvel Comics "Hawkeye: Blind Spot #1" Numbered Limited Edition Giclee on Canvas by Mike Perkins; Includes Certificate of Authenticity. 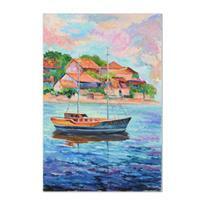 Alexander Antanenka, "Life of a Sailor" Original Oil Painting on Canvas, Hand Signed with Certificate of Authenticity. 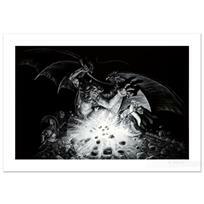 "Gandalf Versus Balrog" Limited Edition Giclee by Greg Hildebrandt. Numbered and Hand Signed by the Artist. Includes Certificate of Authenticity. 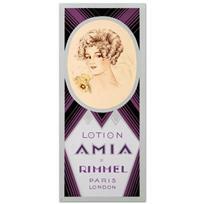 "Rimmel-Lotion Amia" Hand Pulled Lithograph by the RE Society. Includes Certificate of Authenticity. 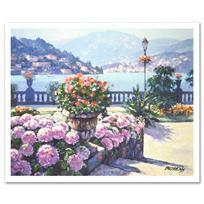 "On Lake Como" Limited Edition Hand Embellished Giclee on Canvas (30" x 24") by Howard Behrens (1933-2014). Numbered and Hand Signed with Certificate of Authenticity. Ringo (Protege of Andy Warhol's Apprentice - Steve Kaufman), "Happy Birthday Mr. President" One-of-a-Kind Mixed Media Painting on Canvas, Hand Signed with Certificate of Authenticity. 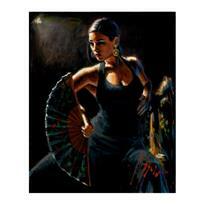 Fabian Perez "Celina Con Abanico" Hand Embellished Limited Edition Canvas (40x32); Hand Signed, with COA. 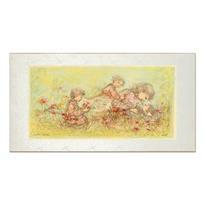 Edna Hibel (1917-2014), "Natures Caress" Limited Edition Lithograph, Numbered and Hand Signed with Certificate of Authenticity. 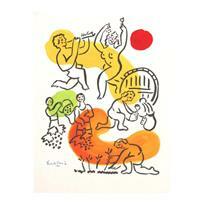 Alexander Astahov, "Chagall View" Hand Signed Limited Edition Giclee on Canvas with Letter of Authenticity. 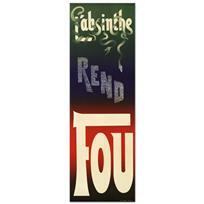 "L'Absinthe Rend Fou" Hand Pulled Lithograph (14" x 43") by the RE Society with Certificate of Authenticity. 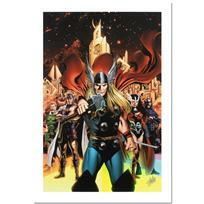 "Thor #82" Extremely Limited Edition Giclee on Canvas by Steve Epting and Marvel Comics. Numbered Out of Only 4 Pieces and Hand Signed by Stan Lee (1922-2018). 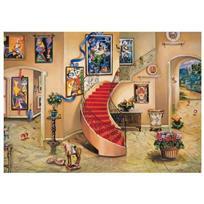 (28" x 39") Includes Certificate of Authenticity. Custom Framed and Ready to Hang. Marvel Comics "Ultimate Spider-Man #126" Numbered Limited Edition Giclee on Canvas by Stuart Immonen; Includes Certificate of Authenticity. 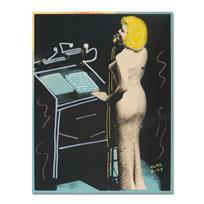 Ringo Daniel Funes (Protege of Andy Warhol's Apprentice, Steve Kaufman) "Scarface" One-of-a-Kind Mixed Media Painting on Canvas, Hand Signed with Certificate of Authenticity. 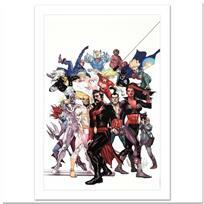 "Defenders: Strange Heroes #1" Limited Edition Giclee on Canvas by Leinil Francis Yu and Marvel Comics. Numbered and Hand Signed by Stan Lee (1922-2018). Includes Certificate of Authenticity.